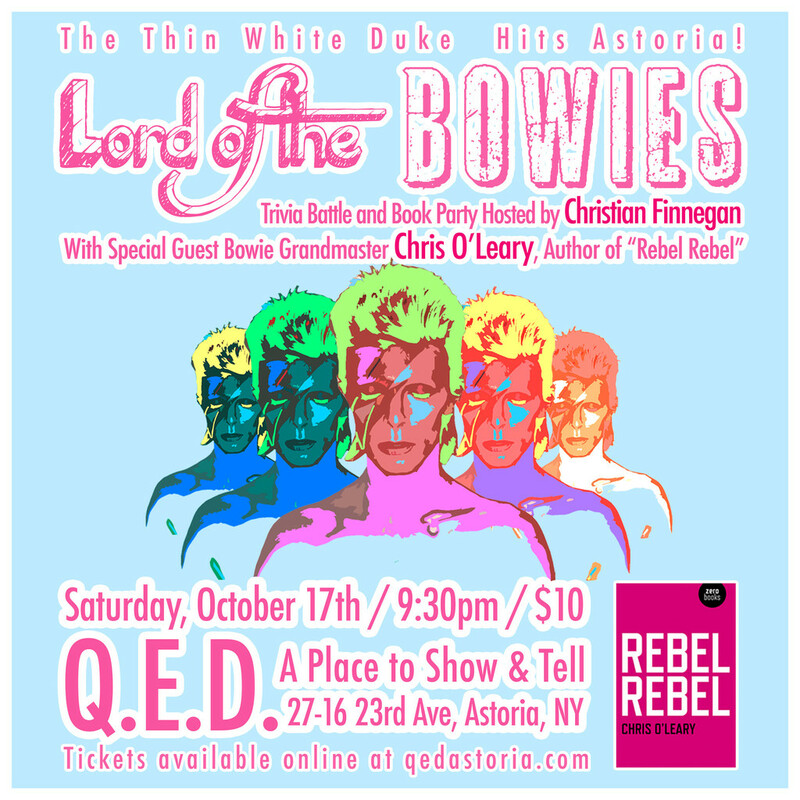 If you live in the New York area, or are visiting NYC on Saturday, October 17, some good news: I’ll be doing a Rebel Rebel reading at Q.E.D., a fine establishment that’s located in Astoria, one of the most charming neighborhoods in Queens. Ah, but it’s not merely a reading. It’s “Lord of the Bowies” night, at which the comedian Christian Finnegan and I will co-host an epic Bowie trivia contest. The winner will get a signed book and other swag. There will also be lots of Bowie music: I will lobby for “Laughing Gnome” and “Rupert the Riley” in the playlist. So if you’re a Bowie fan, I can’t think of a better way to spend a Saturday night. Hope you can make it. It should be fun. You can buy tickets NOW. I recommend that you do so, as there’s fairly limited seating. For directions and other information, Q.E.D.’s main site should have all the answers you need (here’s their FAQ). But if not, leave a comment and I’ll try to help. This entry was posted on Tuesday, September 15th, 2015 at 10:27 am and is filed under Rebel Rebel (Bowiesongs Book 1). You can follow any responses to this entry through the RSS 2.0 feed. Both comments and pings are currently closed. I notice in the “Lazarus” casting call that you posted that only the description of Newton ends with the words “This role has been cast.” Does this mean that David himself will be playing Newton (again)? no, it’s the actor Michael C. Hall—his casting was announced a while ago.